Winter Madness: What's in Season — The Hungry Gypsy: A Personal, Health, Food and Travel Blog. In the western world, we often have access to fruits and vegetables in winter months despite the fact that many of those foods are not in season. In order for that to happen, the food usually has to be shipped a great distance. One excellent way to eat summer fruits and vegetables in winter is to buy them frozen. That is definitely a cost efficient way to eat whole foods that beats the hell out of most canned options that are pumped full of sodium and other additives. Still, fresh fruits and vegetables are certainly great so what is a gal to do? Well, for one, she could start by realizing that eating seasonally is a wonderful thing. Winter may not be full of strawberries and cherries, but there are wonderful foods that are in season in winter. As a bonus, these winter foods actually contain nutrients that are good for our bodies in these colder months. 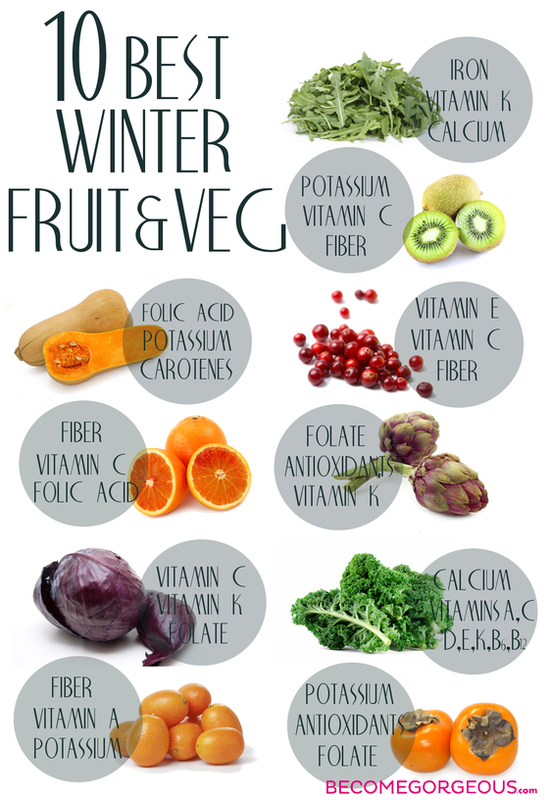 Here is a great graphic from BecomeGorgeous.com that mentions some of the nutrient profiles of winter foods.